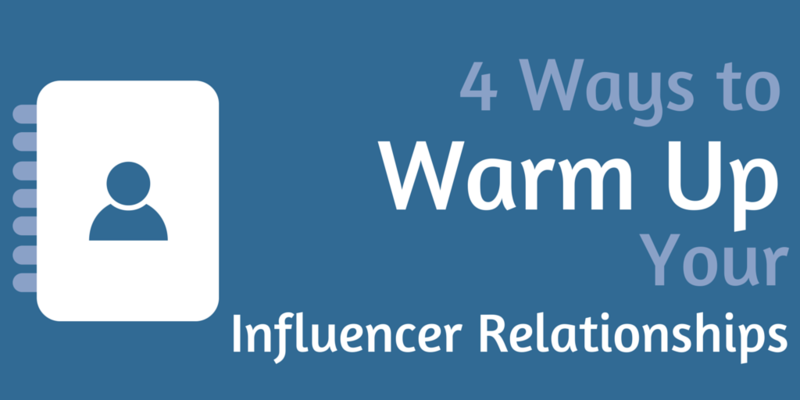 When is the best time to build a relationship with an influencer? Before you need it. Think about it. If you were at Starbucks without a credit or debit card (and don’t have their app) and were a few quarters short paying for your coffee, who do you think would be more likely to help you out: the stranger in front of you in line, or the close friend waiting for you at the corner table? People are always more willing to do something for someone they know and like. That’s true at Starbucks, and it’s also true in public relations and marketing. Regardless of an email’s contents, it won’t feel like a pitch if it’s from a friend (and if it’s pitched well). That’s why I like to start building relationships with people before I need them for anything. For months, and sometimes longer, I’m talking to someone, sharing their content, and helping them when I can. If there ever comes a time when I need to ask them for something, even something as small as a tweet or their opinion on something, they’ll be more likely to say yes. I call this warming up the relationships. By the time a pitch lands in someone’s inbox, it’s not a cold email. So, you may not know the details of the campaign you’ll be using influencer marketing with six months down the road. But it’s not hard to get a general idea. For example, let’s say you work for a startup. You may not know all the details of the product updates you’ll have down the line, but you don’t need to know to start laying the groundwork. You could even narrow it down geographically, or look for only journalists. Whatever you think will lead you to the people that will be truly interested in what you may have to say, try it. You can also sign up for Google Alerts for your competitors’ names or use Google News and Newsle. Once you’ve created a targeted list of people whose radar you want to get on, it’s time to start interacting with them on multiple platforms. Alex from Groove HQ has a great post on this that even includes a spreadsheet for tracking your progress (and it was great timing that I found that post this morning!). I learned this technique from Alexis Grant a few years ago, and it’s been invaluable to me since. It has helped me find guest blogging opportunities, guest bloggers for my own company’s blog, be quoted in publications, and get really good advice when I need it. Basically, create a Twitter list of influencers so that it’s easier to stay up-to-date on what they’re tweeting. This is another thing you can do right in BuzzSumo. Make sure it’s private so no one else sees it, and make it easily accessible. Bookmark it in your browser. If you use a social media dashboard like Hootsuite, add the stream to your front page so it’s one of the first things you see upon logging in. Then, get those influencers to recognize your name. Don’t bombard them with messages, but give each person a retweet here, a favorite there, and a few replies sprinkled in, as well. This will hopefully lead to sparkling conversation and some sort of relationship. Now it’s time to take your connection beyond Twitter. If your influencer writes for a blog or publication, publishes on LinkedIn, or is active on Google+, subscribe or follow them. This becomes one more place where they’re seeing your name, making it all the more familiar when it lands in their inbox. And don’t forget to interact! On Google+, +1 and comment on their posts. Subscribe to their blog via email or RSS. Share and comment on their recent posts. Generally, just pay attention to and show an interest in their work. Pro tip: When you’re sharing their content through a button on their website or a browser plug-in, make sure to customize the content. Usually, the tweet pulled in automatically won’t mention the author; it will either pull in the blog’s main handle or nothing at all. But adding something like “by @bberg1010 for @BuzzSumo” shows that you’re paying special attention to their work in particular. Paying attention to someone’s work is all well and good, but they’ll appreciate you even more if you’re getting others to do the same. For example, if someone on Twitter is looking for advice on something your influencer has written about, send a link to them and mention the influencer’s handle. You can also reach out to them directly, let them know you’re a fan of their work, and offer yourself should they ever need your help with anything. Let’s not forget that the best relationships are mutually beneficial. If you want an influencer, blogger, or journalist to help you out with something, your chances are better if you’ve helped them out first – whether that help came in the form of introducing them to someone or simply sharing their work. So make sure you have a relationship with them that’s based on more that press coverage for your company. Brittany Berger is a 20-something blogger with a crazy obsession with social media and and is currently the Digital Content Supervisor at eZanga.com. During the few minutes of each day she’s offline, she’s probably glued to the TV or her Kindle instead. To learn more about her, find her on Twitter, LinkedIn, or Google+.